Yes, Brexit poses some serious threats to the UK’s economy. Yet while the media only likes to portray the future of the UK’s economy in constant doom and gloom, there exists many advantages and positive signs from the UK’s perspective. 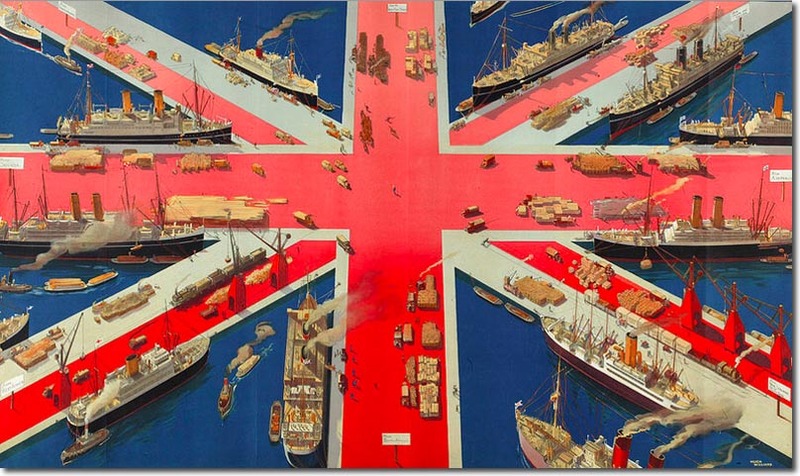 Brexit’s economic challenges can be overcome, and although it may take a while for the UK’s economy to adjust, if there is one country in Europe capable enough of growing and sustaining its economy independently, it is the United Kingdom. Not a believer? – The UK accounts for just under a fifth of total EU GDP and is the second largest EU economy behind Germany (Eurostat). On top of this, we remain one of only two countries within the EU to have kept its own currency, which should be pointed out is stronger than the Euro. One of the best economic decisions we made in the past was to choose to exempt ourselves from adopting the Euro, so before you say we are making another mistake, let’s wait and see how this all unfolds before jumping to any conclusions. The UK’s shift away from the EU market can all start with the vital trade deals it makes with other countries, allowing them to strike further exporting partnerships into markets outside of Europe. Having said that, the European market is currently the UK’s largest trade market (Office for National Statistics GB). Brexit will bring new barriers to trade and break supply chains and deals with EU businesses. This will undoubtedly affect the UK’s flow of trade and, consequently, revenue into the country. However, what we have not been told is that the percentage of UK exports to the EU has been steadily declining over the past few years (Lynn 2019). In fact trade statistics have shown that this percentage has continued to decline even into 2018 as results from the last year were recorded (ibid.). This might be implying that the importance of the EU as an export market is declining. The rest of the world’s economies, for the most part, are growing at much faster rates while Europe’s economies are stagnating (ibid.). Consequently, trade is service based and follows where the most of the demand is, and with the UK’s shift away from European markets, Brexit may only speed up this trend away from European markets. To highlight this trend, last year UK export sales to countries outside of the EU went up by a notable 7.3% (ibid.). This comes in addition to the near 10% decline in exports to EU over the past fifteen years (ibid.). In light of these statistics, it is important to consider that trade relationships and markets are built over years rather than the short term. No shift away from the EU market will happen so quickly. Therefore in the meantime it is still vital that the UK secures some sort of trade deal with the EU, despite this greater trend of exporting to markets outside of the EU. What I am trying to point out is that some positive signs of trade do exist going into our departure from the European Union. For example, UK export sales to China increased by 25% over the last year (ibid.). Going into Brexit, with a deal or not, the trade statistics do make one thing clear. The UK’s economy has already been separating itself from European markets for some time now and this trend isn’t going to stop. With Brexit you could almost say that the political side of things are only just catching up with the economic reality. Bottom line: Brexit began even before the vote to depart the EU. While the political situation is currently a mess, I would argue that with time, a UK economy free of the EU’s regulations can thrive despite the uncertainty surrounding the UK’s future. I’ll take it that the UK’s economy may suffer for the first few periods after Brexit. But come back to me in ten years time, see where our economy is standing in comparison to the EU, for good or for worse, and then let’s talk about Brexit. If one were to ask a group of economists, policymakers, and other public intellectuals how to solve The Great Issue™ of stark global inequalities in wealth and development, they may very well yell “Foreign Direct Investment!” This is exactly what the World Bank has been preaching for the past thirty or so years. 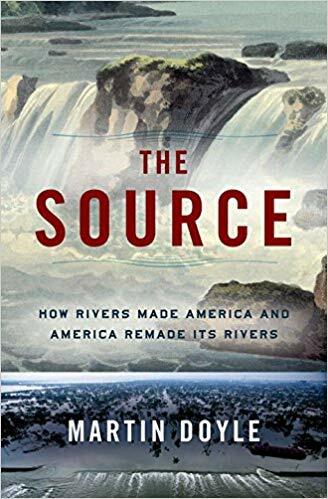 After all, neoclassical economics dictate that the private market should find these massive stocks of human capital, natural resources, and an untapped market to boot too good to pass up on. Considering the globalization of the economy at large it would be suboptimal at best and un-capitalist at worst not to jump on the opportunity these resources offer. Of course, it never was this easy. Resource allocation is a game we play, and when the rules and outcomes are unclear costs potentially outweigh benefits. This is often the case in poor countries; therefore, private parties keen on profits get cold feet and back out. They are wary of expropriations and (government) parties defaulting on payments. In other cases, social unrest, terrorism or even war may destroy a company’s operations abroad. Political Risk Insurance (PRI) encompasses a range of products designed to ameliorate the costs associated with these risks. As stated by Iftinchi and Hurduzeu [pdf], PRI is offered by two main groups; public and private insurers. Public insurers are often linked to, or are an immediate part of, a development bank or government initiative. They tend to be in the market for relatively long-term investments and are less flexible due to their alignment with governments’ foreign policy or sustainability goals. Private parties, on the other hand, insure short- and medium-term projects at highly variable premiums and often with little regard for the (socio-economic) environment. 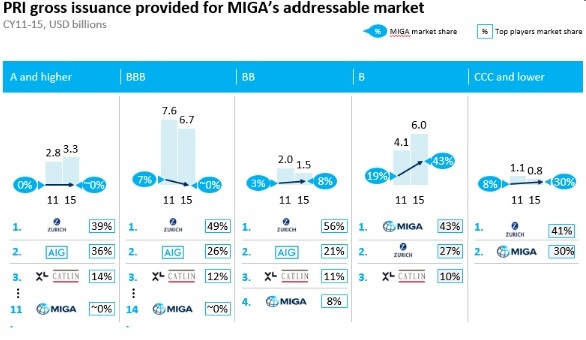 As can be seen in the graph, the main public player is the World Bank’s Multilateral Investment Guarantee Agency (MIGA), with significant market share in countries with the highest risk rating (BB and worse). Zurich Group is the largest private party, insuring PRI across the board and outperforming MIGA in the, quite relevant from an international development standpoint, ‘CCC and lower’ rated market. At its very core, the public provision of PRI is supposed to improve global resource allocation. It allows firms to engage in markets which they previously may not have considered. This very idea was central to the initiation of MIGA by the World Bank [pdf]: “sustainable economic growth in many developing and transitional countries would require stimulation of private enterprise and foreign direct investment.” Albeit easy to get behind, there are definite questions to be raised about the World Bank’s interference in this market. As market shares show, private insurers do not necessarily have a problem with fulfilling the demand in place. This issue was already being raised at the very establishment of MIGA; Stefan Sinn dealt with it extensively in his 1986 “Second Thoughts on MIGA” [pdf] paper. Furthermore, he raises fundamental concerns about the role of insurance provision in resource allocation. As with any type of insurance, risks such as moral hazard may, in fact, worsen allocation. Yes, there are obvious benefits to FDI; its size potential in comparison to other forms of development aid [pdf] says as much. And yes, its flow may very well be improved by PRI products. However, the fundamental questions raised by Sinn remain unanswered some 30 years later. Over the next few weeks, I will further research the growing market of PRI, and the role of public provision specifically. To stay updated and receive the final report, please contact me by e-mail. Malaysia supported BRI under the rule of the former Prime Minister Najib Razak. Malaysia signed deals for infrastructure to be funded by the Chinese state-owned and commercial banks. The people of Malaysia supported these deals as they had nothing to lose from more jobs, and better infrastructure. They believed the BRI would help the economy and raise their quality of life. Yet, the new government, led by PM Mahathir Mohamad, did not feel this way. The former government was corrupt, and Mahathir believed that Najib began unnecessary ventures the country could not sustain, which led to the cancellation of $22 billion of BRI projects for rail links and gas pipelines. As a cautionary tale, consider that Pakistan borrowed from Chinese commercial banks until it needed an IMF bailout. Bottom Line: China’s BRI promises investments to link numerous countries. It would be wonderful if the BRI’s promises materialized, but the reality is different. Thus, countries need to be careful of BRI risk, as Malaysia discovered with corruption and excessive debts from unnecessary projects. Microfinance: Is it a trap? Microfinance (MF) was invented in the 1970’s as a means of uplifting the poor. Since then, it has been widely pursued by NGO’s and even international organizations such as the World Bank. Its inventor, Muhammad Yunus, even earned a Nobel Prize for it. But does microfinance really deliver on its promise? Or are there adverse effects that outweigh its benefits? This post will examine microfinance’s effect on entrepreneurs’ prosperity. In the blog’s one-handed tradition, I will be fairly biased, in that I zoom in on a drawback of microfinance: displacement effects. Displacement refers to when microloan entrepreneurs crowd other business out of the market, as Milford Batesman argues in his book Why Doesn’t Microfinance Work? Displacement occurs when microfinance entrepreneurs compete with other small businesses over limited jobs for self-employed workers in developing nations. Exceptions to this rule exist, such as in newly formed Bosnia-Herzegovina, where many unemployed were highly educated and could therefore perform a wider variety of tasks. However, in many developing countries, such as Bangladesh, MF workers stick to jobs like farming, craftmanship or keeping a small shop. This competition has two adverse effects for workers in the sector. First, it pushes prices down. For example, more barber shops open, but the demand for haircuts hasn’t necessarily changed. 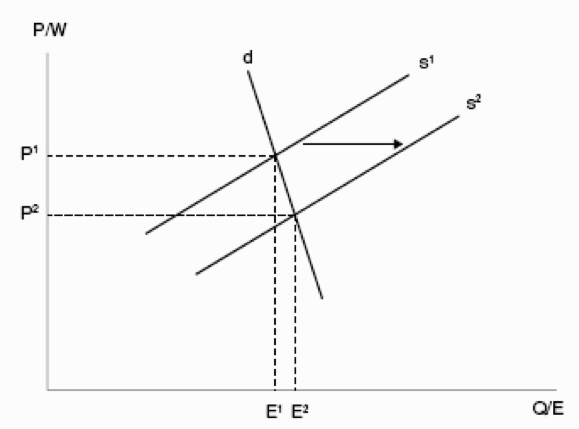 Thus, as illustrated in the figure below, the supply curve moves outward and prices drop. Second, the new barber shops steal away customers from the old barber shops. Even though the quantity demanded of haircuts rises slightly, that quantity has to be shared among more workers. The result of both these mechanisms, is profits decrease, as Honohan discusses. The shrinking of profits due to displacement has two implications. First, it is a key limitation to many studies examining MF’s economic benefits, as Honohan points out. Second, it means that capital accumulation for the poor becomes much harder. Microfinance advocates themselves admit that capital accumulation is key to poverty alleviation. They use anecdotes of entrepreneurs that put their profits into their children’s education, or the expansion of their business. Displacement undermines this ability. The story of rent reduction seems to be one of collective-action failure. Microfinance benefits individuals who take a microloan and start a business. However, it hurts all workers in that business by pushing their profits down. One might object to the displacement argument, that microloans can also be used to make investments that boost productivity, thereby boosting the profits made by businesses. Honohan provides an example of this: a trader buying a bike, making him faster (and more efficient) than other traders on foot. Here, the bikeless trader is outcompeted and replaced by a more efficient service (i.e. creative destruction). There is no literature about how these productivity loans compare to the loss of profits for entrepreneurs. However, I would argue these examples are less frequent. Micro-finance loans tend very small, typically around $27. This is often enough to buy the basic supplies for a business, but not to make additional investments. Thus, entrepeneurs might use microcredit to improve on the margins (i.e. buying a bike), but it is uncertain whether this will create enough value to compensate for profits lost due to displacement. Bottom line: Microfinance can reduce entrepeneurial profits and thus slow the poor’s rise out of poverty. From this perspective, Microfinance looks more like a trap than an escape. Author David ZetlandPosted on 27-Feb-19 03-Mar-19 Categories GnD, Guest post6 Comments on Microfinance: Is it a trap? Brazil experienced high growth from 2000 until 2014, when the country was suddenly in an unprecedented recession. Although the country’s GDP showed some recovery in 2017, Brazil elected far-right politician Jair Bolsonaro as president in a response to “rising crime and two years of political and economic turmoil”. As what follows will suggest, the election of Bolsonaro is not so much a result of the stagnation of economic growth, as it was rooted in the lack of development following the past decades’ growth. To assess economic development, Sen and Nussbaum’s capabilities approach will be used as a definition to measure economic development in Brazil. Two of his most important political promises that explain why Bolsonaro gained so much support are his plans to fight corruption and reduce crime rates. The former deals with capability 10A, the political aspect of control over one’s environment, whereas the latter aims at tackling violations of capability 3, bodily integrity, and capability 10B, the material component of control over one’s environment. One might argue that a tougher policy on crime even relates to the first capability, life, in a country where homicide rates are among the highest in the world. The lack of economic development is also visible in the extreme income inequality and the over 23.3 million Brazilians, over 10 percent of the population, living below the poverty line, which inhibits almost all aspects of human development. This also explains why many people from minorities, such as people of colour and women, voted for him, despite his countless insults; they are overrepresented in the poorest groups of Brazilian society. It is important to note here, though, that many of Bolsonaro’s plans will probably not enhance human development as defined by Sen and Nussbaum, the argument is rather that the reason why people voted for him, are the obviously lacking aspects of development that he addresses. What gave to rise Bolsonaro, however, started five years before his presidential election, in 2013, when all across Brazil, people took to the streets “with a range of demands from affordable public transportation to fixes to the government bureaucracy”. These demands are rather aimed at enhancement of quality of life than at quantity and seem to have more to do with development than growth. Popular discontent in Brazil was mainly centred around issues of development, but many of them are related to economic growth issues, such as stagnation and a drop in inflation that threatens the position of the middle class. At the same time that development is lacking, the prospects for economic growth in the next years are also critical, especially since Bolsonaro, in an attempt to recover Brazil’s economy, wants to break most economic ties with China, while trade with China grew with 4000% between 2000 and 2013, largely contributing to Brazil’s economic growth. The irony is that at the same time that the ‘Trump of the Tropes’ wishes to copy Trump’s strong anti-China economic policy, it was exactly this American trade war with Beijing that has boosted Brazilian exports to China. Bottom line: The rise of Bolsonaro as Brazil’s new president is rather a response of human development falling behind for years than just a response to the lack of economic growth between 2014 and 2016. Is mass consumerism a choice? We all know we live in a consumerist society, but what are its origins and did it develop naturally? This post explains the surprising influence of Freud on our consumerist society. It all started at the 1929 Easter March in New York when a group of women lit their cigarettes— an act publicly unacceptable at the time, and even considered rebelliously feminist. For many, including the women, the lighting of their cigarettes seemed to indeed be part of a greater struggle for power; the Women’s Liberation Movement. However, few were aware that the actual intention behind the action was for the American Tobacco Company to increase cigarette consumption among women. 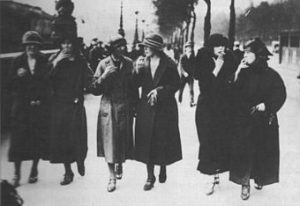 These women were paid by Edward Bernays, Sigmund Freud’s nephew, to light their “torches of freedom”— the cigarette became symbolic of women’s freedom. I argue firstly that this event marked only the beginning of the implementation of Freudian psychoanalysis as a tool used to promote consumerism in America, and that still today, we are living in a society full of passive consumers. In part one and part two of the brilliant documentary The Century of the Self, we see how Freud’s ideas were employed in order to create a mass consumption society. Freud believed that humans are irrational, governed by their subconscious fears and desires. Bernays, through his work as a Public Relations Counsellor to American corporations, applied these theories in his advertisements. These ads appealed to people’s innermost desires, leading them to consume more. For example, Bernays suggested to remove an egg from an instant cake mix which consumers had to add in themselves. He believed this would help eliminate the sense of guilt housewives felt for not having made a cake themselves from scratch. 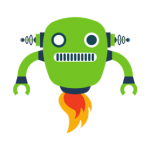 This seemingly simple change had the desired effects and sales increased massively. This strategy turned people into passive consumers. However, this passivism turned into activism when people began to notice and discover the selling strategies and conditioning. In 1962, awareness increased especially after celebrity and high-profile psychoanalyst patient Marylin Monroe committed suicide. In part 3, it is shown how corporations in the 60s and 70s turned activism into a new kind of consumerism based on individual rather than mass needs. During the 60s, an alternative psychoanalytical perspective regained popularity, it was originally developed by Wilhelm Reich who believed the opposite of Freud. In his view, humans are good in and of themselves and that society repressed their inner selves which made them violent and mentally unstable. He argued that people should express their fears and desires which would allow them to be freed of the conditioning and control by society. This created individuals with individual desires, which meant the end of mass consumerism and a problem for corporations who couldn’t sell their mass-produced homogenous products to individuals. But then a different psychologist, Abraham Maslow, argued that people’s different desires could be categorized in a hierarchy of needs. This meant that corporations could now develop products based on categories in the hierarchy of needs. Therefore, the products seemed highly personalized which emphasised the feeling of individuality in consumers, which made them buy them. By the end of the century, society had experienced an ideological shift from a mass consumerist society to an individual consumerist society which allowed companies to supply products for ever-changing needs which allowed consumerism to flourish like never before. A report by the US Department of Labor and Statistics [pdf] looked at consumption statistics in the US between 1901 and 2003. From 1918-19 to 2002-03 household expenditures grew from around $1,500 to roughly $41,000. On top of that, from 1959 to 2001, consumer spending on non-essential goods and services increased from 4% to 9.3%. Today, nearly 50 years later, we are still living like passive consumers. From 2003 to 2017 US consumer spending increased from $41,000 to $60,000 a year. The only exception being a slight drop in the years after the financial crisis of 2007-08. Consumer spending on non-essential goods and services as a percentage of total spending also increased. From 2001 to 2011 this grew from 9.3% to 11.2%. Therefore, not only do we see a persistent but a growing passive consumerist society that over a time period of nearly 100 years was fabricated through Freudian psychoanalysis. Bottom line: We are still passive consumers in society, influenced through the theories of psychoanalytic thinkers. Author David ZetlandPosted on 26-Feb-19 03-Mar-19 Categories GnD, Guest post3 Comments on Is mass consumerism a choice? Edinburgh is charging a tourist tax (£2/head/night) to offset congestion. I think Amsterdam needs to charge €10/head/night. Pokemon Go is the first stage of our entry to the Matrix. Chris Anderson (TED) on community, ideas and our future as humans. I started thinking about doing a podcast last year because I wanted to find a new way of learning, catching up with people in my network, and bringing new ideas to people. 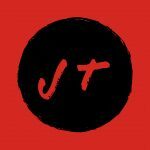 I still like blogging (and will continue to write here), but podcasting provides a different perspective, most obviously because it allows conversation. One of the things that’s so cool about the new media technology is that people want . . . They just want direct communication. They don’t like high-level production values, all to people on YouTube, and they’re very savvy media consumers. A highly produced television show just looks like a lie. If you’ve got something to say, they just want you to sit down and say it. They don’t even want you to edit it so that it’s smoother because that just looks like you’re spinning the content, and you probably are. 01 // What do we mean by water privatization? 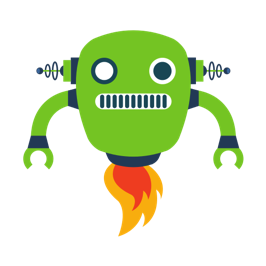 * Jive Talking is now syndicated via Stitcher. I’ll get Apple iTunes and Google Play links soon! A nice discussion of Core Economics and the quest to make economics more useful (realistic) to students. 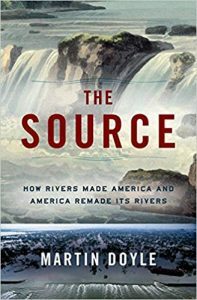 This book review on the varying and pervasive impacts of climate change leads me to think that we are moving from a world dominated by the “information revolution” (the one displacing the industrial revolution) to one dominated by the “climate revolution,” which is — as all good revolutions do — overturning our ways of living. The sad part is that most of the climate-driven change will be unpleasant, expect perhaps for those who swap reality for a virtual lifestyle (ironically, and too late, reducing the footprint of their consumption). The pay gap between skilled and unskilled workers is growing dramatically in the US. The need for basic income (as a way of preventing rebellion) is rising. Data trackers and advertiser don’t even know what they’re doing. Interacting environmental problems mean more, worse crises. Heineken’s behavior depends on local norms (of sexual harassment)?